"An absolutely fascinating road trip populated by real and endlessly interesting people. First rate." "A valuable first-hand account... Fascinating"
"[An] amazing effort... Entertaining and eccentric"
"An intimate portrayal of a social movement... Revealing insights"
"An affecting, effective piece of documentary filmmaking... 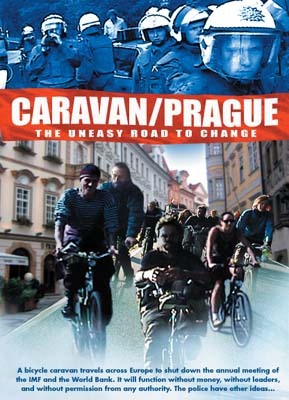 Wonderful"
"Relevant as both history and inspiration"
Caravan/Prague, a feature-length documentary, is a first-hand account of this journey and the historic 2000 Prague protests. 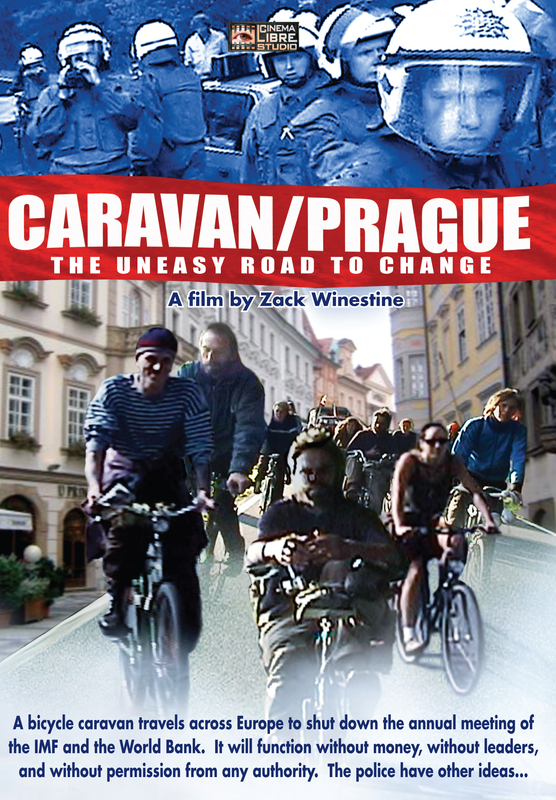 Filmmaker Zack Winestine rode the entire trip with the caravan, filming from his bicycle as events unfolded. He recounts his hopes, fears, and questions, conveying the experience of participating in a community trying to bring about change that is both visionary and concrete. 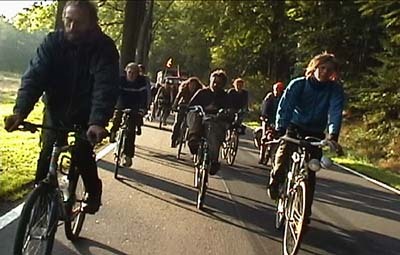 DVD extras include an extended scene, trailer, and a DVD-Rom feature with extensive information about economic globalization. 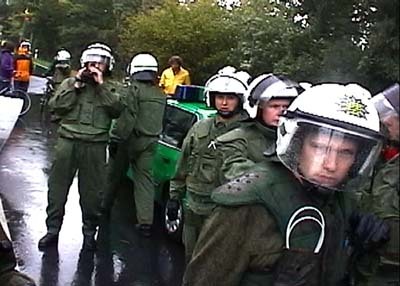 Also included is Quebec: At the Wall, a short film about the 2001 FTAA protests in Quebec City. The DVD is available direct from the Cinema Libre Store and from most internet DVD retailers including Powells.com and Amazon (note that Powells - a great bookstore - is cheaper than Amazon, and Powells is unionized). The DVD is also available from AK Press. The film can be downloaded for either rental or purchase from Cinema Libre. Note: This DVD will sound best if all Audio DRC (dynamic range control) options are turned OFF on playback equipment - even light dynamic compression seems to have a more noticeable (and more negative) effect on this DVD than is usually the case. Howls for Guy Debord (pdf) - an article from the Summer 2009 issue of Film Quarterly by Zack Winestine about some rather interesting things that happened at the first "official" US screening of Debord's Hurlements en faveur de Sade. A somewhat different take on these events can be found here. TAKE ACTION: Stop the Colombia Free Trade Agreement!